Iceland touched me in ways I never thought possible - it’s a country I’ll keep close to my heart forever. Before travelling to Iceland, I knew of its reputation as a beautiful polar land of vast landscapes and was excited to explore it. I’ve explored both Patagonia and Antarctica before, though, and I didn’t think anywhere could rival their beauty. Boy was I wrong! Iceland’s vastness reminded me of Patagonia, but this country gives you an entirely different experience. The moment we left Reyjavik’s airport and started driving along the winding roads through the Reykjanes peninsula, the sun came out of hiding. The sounds of nature filled the air, and I felt as though I was entering another world entirely. The lava fields and mossy rock formations that reminded me of Lord of the Rings stretched on forever. I felt a wave of peace wash over me, and my heart knew that we were in for a really special adventure. What better way to start an Icelandic adventure than with a trip to the world famous Blue Lagoon? This epic lagoon is just a 20 minute drive from the airport and is on the way to Reykjavik. We recommend treating yourself to the spa package, which I found delightful! During the treatments, tranquil and relaxing spa rooms carved out of natural rock gives the experience a truly Icelandic feel. The package also gives you access to both the main lagoon and the private retreat lagoon – an exclusive lagoon which only holds a handful of people at a time. The best way to end is with the retreat ritual; you’ll scrub and hydrate your body with the richest minerals of Iceland, and it’ll leave you feeling like a newborn baby. We then continued our journey on to Iceland’s capital Reykjavik. 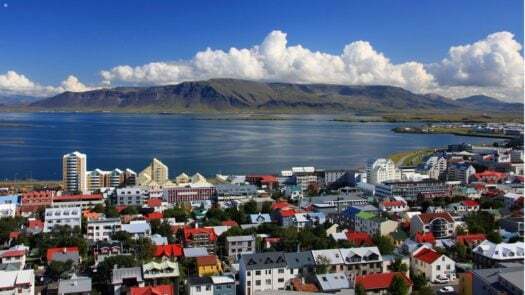 This charming little city is filled with colourful houses, home to over a third of Iceland’s population (just over 120,000 people). Despite the recent boom in tourism, you don’t see any branded shops – the city has kept its charm alive with local boutiques and authentic quality products. I loved it! Prices are high, but so are the living standards – everyone can comfortably live on their salary, and tipping is virtually non-existent. What struck me most was how friendly everyone was, as I feel as though we’re losing the art of kindness slightly in the western world. Friendly receptionists, chatty waiters, helpful shop assistants and jovial taxi drivers – everyone seemed so content! I can’t wait to go back to Reykjavik and delve deeper into Iceland’s fascinating culture. After a short evening exploring Reykjavik, we headed off to the South Coast and the Golden Circle. The South Coast is filled with extreme natural wonders: volatile black sand beaches, the dramatic cliffs of Dyrhólaey, gigantic waterfalls and a glacier that carved an entire valley. All of these dramatic landscapes make you feel so small, and you really appreciate the power of Mother Nature. Iceland is mainly about driving and admiring pretty landscapes, but once I reached the South Coast I could have driven forever. Unfortunately, our scheduled glacier hike got cancelled due to the weather conditions, but there was so much to see and explore that we didn’t feel like we were missing out at all. Our third day was a fairytale – the entire ring road was covered in snow, and it showed no sign of stopping. It really was a magical winter wonderland. The wonderful thing about Iceland is how adaptable everyone and everything is to extreme weather conditions, so no matter the weather nothing stops. Just make sure you’re wrapped up with warm, waterproof layers and you’ll be able to experience nature in all its states: rain, snow, wind and sun. Sometimes, you can even see all four of these in one day. Normally, I hate the cold but in Iceland I didn’t really mind – with my warm, waterproof layers wrapped around me, I could appreciate whatever nature brought. In the Golden Circle, we got to visit the amazing Thingvellir National Park. Here, the American and Eurasian tectonic plates meet and it’s where Iceland’s parliament was first established over a thousand years ago. We also witnessed incredible hot springs, with water springing straight out from deep inside the volcano. The biggest geyser in Europe is also located here, and we watched it come to life right in front of our eyes. As we drove through the snow into the forest, we were treated to stories about elves who are thought to have survived until today. These stories have been passed down from generation to generation through word-of-mouth, so they offer a real insight into Iceland’s past. Once we made it to the glacier, we chose to tour in a super jeep – this gave us flexibility and allowed us to escape the crowds. We were pleasantly surprised when this turned out to be an experience on its own. All the while, we were crossing rivers and driving off piste into places where all you could hear was the wind and all you could see were mountains and valleys covered in white. It was truly magical! If you’re an adventure seeker, don’t miss snorkelling in Silfra. The water in this lake is so clear that you can see over 100 metres down – that’s two to three times more than anywhere else in the world! You’re rewarded with endless shades of blue, multicoloured algae and fascinating rock formations. The water is so clear here that you feel like you’re flying over it! The water is chilly – around 2 – 3 degrees so you’re provided with a full wetsuit. Under this, make sure you wear think warm layers to keep the heat in. The suit makes you naturally float and the diving instructors here teach you how to flip around and rest if you need to. In my case, I used my resting moments to appreciate the bright blue skies and take in another shade of blue – an extraordinary experience. One thing I didn’t get to experience which I’d love to go back for is the Icelandic horses. These strong yet gentle creatures are Iceland’s pride and joy. To showcase how amazing these majestic creatures are, Iceland hosts regular competitions. Generally, the horse with the most graceful and smooth riding skills is the one that takes the crown. To test the horses’ grace, jockeys hold a pint of beer in their hand whilst riding them – it’s amazing how many don’t even spill a drop! Eventually, all adventures must come to an end but some places leave such an impression that we know we will return to them one day. This is exactly how I feel about this beautiful country, and so I say – until next time Iceland! If you would like to take a trip to Iceland and follow in Milda's footsteps, get in touch with us today.